River Club in Pawleys Island was originally a rice plantation and one of the first Myrtle Beach plantation courses. It offers the perfect chance to experience LowCountry golf at its finest. 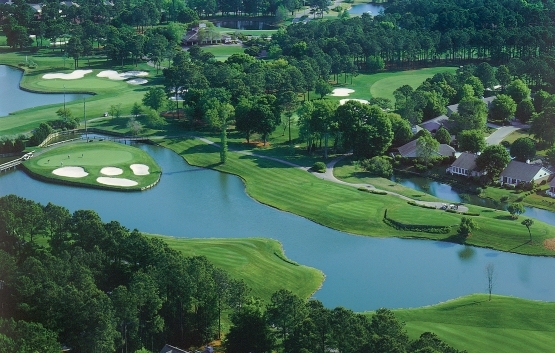 This Tom Jackson signature course offer outstanding Myrtle Beach golf photo opportunities. Although not a particularly long course by today’s standards, River Club demands strategy and positioning off of the tee to avoid the many water hazards that include some man-made and many natural ones. Water comes into play on 14 of the 18 holes. Bunkers are in abundance as they number in the triple digits. Accuracy is important, but the beautiful layout can be enjoyed by golfers of all skill levels. Golf Digest gave River Club 4.5 Stars in its “Places to Play” category. River Club is part of the famed Waccamaw Golf Trail. While making plans for you next Myrtle Beach golf vacation consider a Myrtle Beach Golf Authority golf package. Myrtle Beach golf packages offer the best Myrtle Beach golf deals. These packages can include everything from the best Myrtle Beach accommodations to Myrtle Beach golf lessons. It is time to book your Myrtle Beach golf package today!